You are at:Home»Training»What is Tabata Training? Tabata is a form of high intensity interval training (HIIT) which was initially designed to be performed on a stationary bike by Japanese scientist Dr Izumi Tabata. The idea behind Tabata training is to perform 8 rounds of maximal intensity exercise followed by short periods of rest, the timings for this are 20 seconds work followed by 10 seconds rest. You can implement the training protocol into your own routine quite easily and works really well as a workout finisher. 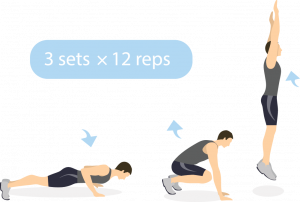 One favourite here at Short Motivation is to pick four exercises, (for example, burpees, squat jumps, mountain climbers and press ups), and do two rounds as hard and fast as possible. Four minutes and you are done. But, be warned, if you can still breathe at the end of the four minutes, you probably didn’t push hard enough! The reason why this method of training is so highly rated is due to the accumulated fatigue you experience after you’re unable to regain your breath between stations. This results in a continued calorie expenditure long after you’ve finished the workout itself, which is referred to as EPOC (excess post-exercise oxygen consumption). More regularly known as the ‘afterburn’ effect, essentially you just continue burning calories after your workout is finished, something that is the bonus of high intensity training versus low intensity training. Tabata is a really good way to implement HIIT into your training whilst you’re away from your regular gym, without spending too much time doing it. The added bonus is that you don’t need any equipment to perform it –you could perform a version which uses equipment for each station but it’s by no means necessary. Why not give it a try and see how you get on? It is an excellent way to burn fat, build some muscle and keep on top of your training wherever you are in the world, no matter how much/little time you have. Olly is the Short Motivation fitness and training advisor. He is a level-3 PT instructor, specialising in TRX and kettlebell instruction, and manages his own gym in the United Kingdom.